In 2007, a friend asked me if I could build her a hoop for weaving rag rugs. She'd been taking a class on this, and they were using bicycle hoops to weave round rugs in. But this very much limited the size of the rugs, and she asked me if I could build a bigger one. 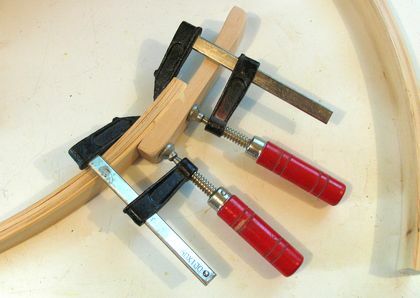 Sure I said, figuring this would be a quick and fun thing to try to do with bending wood. I wanted this to be a quick project, so didn't want to fuss around with steaming or soaking the wood, so decided to cut the wood into strips and form the archs with a bent lamination. I also didn't want to build a complex jig. The whole idea was to make it quick and simple and not use a lot of wood. If a bending moment is applied to any sort of rod or strip, it naturally forms a circular arc without any support in between. The ends of the board of this jig are meant to apply a bending moment when the strips of wood are clamped to them. The two legs sticking up are really more meant as a guide, and to help when actually strapping the pieces around the board. I cut 4mm thick strips off a spruce 2x4. Four of these layered on top of each other form the arch. The photo at left shows me testing bending these strips, before applying any glue. Without soaking or steaming the wood, a radius of 45 cm was all I could do with the strips 4 mm thick. Although some pieces actually also had knots in them, which didn't help any. When I subsequently bent the pieces again while gluing it up, I noticed the pieces bent much easier. Just the moisture in the glue was enough to soften the wood up a little. So short of steaming, just moistening the wood would help. 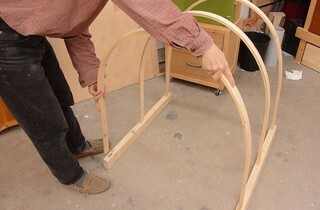 with the arch bent, I put on lots of clamps to make sure the four strips made good contact with each other. 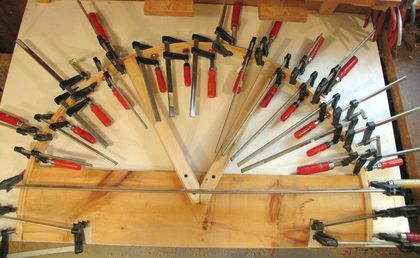 I started from one end, and applied a clamp every 5 cm. That way, any mismatch in length of the strips would get pushed to the end, as the glue was still slippery when I put the clamps on. 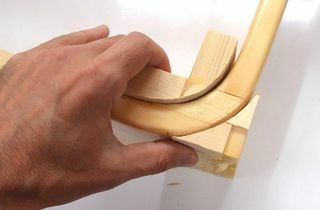 The thing that will subsequently hold the curved shape is that the pieces were glued together while curved, so the integrity of the glue joint is very important. The main thing that holds the shape of the bent lamination is that the pieces were glued together while bent. I was expecting the hoop to relax its curvature a little once out of the clamps. The stiffness of a piece of wood is proportional to its thickness raised to the power of 3. 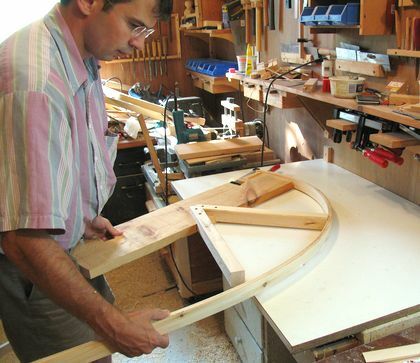 With the composite arch, its like having the arch itself at the curvature of the jig, but four pieces one quarter its thickness trying to pull it straight. But each strip, being a quarter of the thickness, has one 64'th of the stiffness (4 raised to 3), and the four of them together one 16'th of the stiffness of the composite member as a whole. So I'd expect the hoop to relax by about 1/16'th. But as it turned out, the relaxation was only by about 1/30'th. I'm pretty sure part of what reduced the amount of relaxation is that the wood was moist from the glue while bent into shape. If thin enough laminates and enough moisture are used, the curvature of the piece will actually increase (decrease in radius) once its out of the clamps and dried, because the thickness of the composite member will decrease a little as it dries out again. Moisture has much less effect on length, So you end up with about the same difference in length of the curves for the inside and o utside of the curve, but less thickness in between. And that results in an increase in the rate of curvature. I didn't get perfect side to side alignment with all the strips. So I used my jointer to flatten the edges of the hoop, rotating it as I pushed it along the jointer. Kind of a funny way to use a jointer. 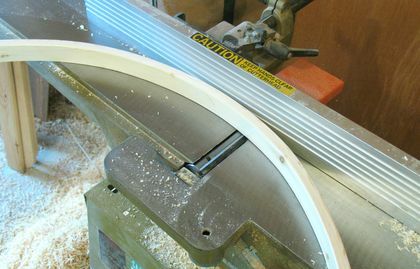 Overall, I bent 4 mm thick strips into a 45 cm radius circle. On the famous Ikea chairs, the legs are laminated out of strips of 1.3 mm in thickness, and are bent to a radius as low as 45 mm in places. 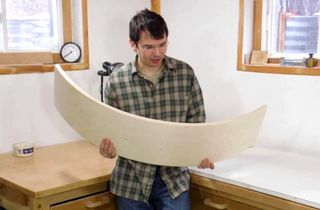 So while I was bending to a radius 112 times the thickness, Ikea bends to a radius of just 34 times thickness. 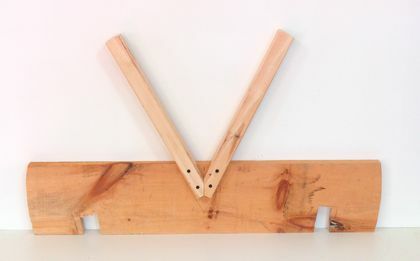 No doubt, a more suitable species of wood, knot free, and steamed and pressed into a proper mold help them achieve their much higher relative bending without breaking the wood. 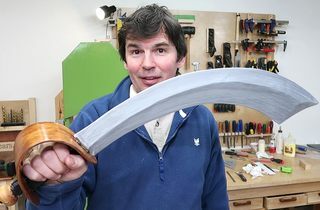 I was able to get a much greater degree of bending by using a different species of wood, and steaming the wood before bending when I made the hand-guard for this halloween pirate sword. a few years later. The hoop was intentionally made of two halves, so that it could be disassembled for more compactness. 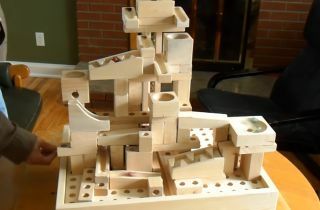 To join the pieces, I made two blocks of wood. 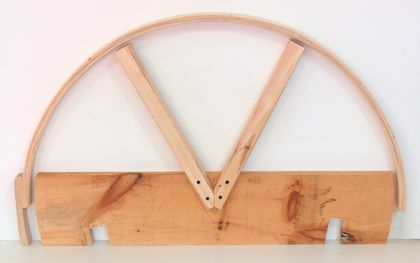 The blocks arch with the curve of the hoops, although the blocks themselves are not bent, just a curved cut in a straight piece of wood. The block is glued to one part, and screws onto the other. This shot shows gluing the block in place. Two screws (not seen in the photo) are used to screw the mating hoop piece into the block. Also barely visible along the bottom edge is the series of holes I drilled in the frame for attaching the warp threads to the frame. I also thought it would be fun to be able to create oblong rugs with this frame, so made two extension pieces to go in between the circular segments. 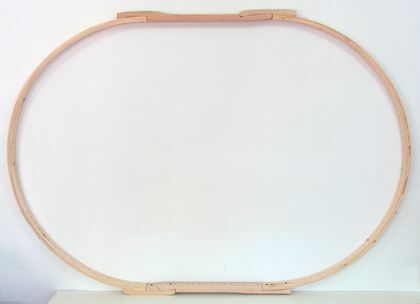 With these pieces, the frame becomes a sort of stretched circle. This does make putting the initial warp threads a bit tricky, as the threads can no longer just go through the middle diametrically. Rather, two nodes at the center of the two semicircles need to be tied together with a strong warp thread, and then the individual threads pulled through that loop. Once the rug is woven, there shouldn't be any more unusual tension in the warp threads.